This entry was posted in Autumn and tagged Autumn, Autumn colours, Fall, Leaf Litter, Nature's compositions, Photography. Bookmark the permalink. It’s interesting that when I think of wet leaves, I remember smells, but dry leaves always evoke memories of sounds. I love the scent of wet leaves, but who doesn’t enjoy kicking their way through dry leaves? or crushing them in hand? Kicking one’s way through dry leaves always takes me back to childhood, and I still enjoy the fun of doing it. I love the pattern of the leaves, Andy. Your image is inviting my eyes to wander. Thanks Jane. 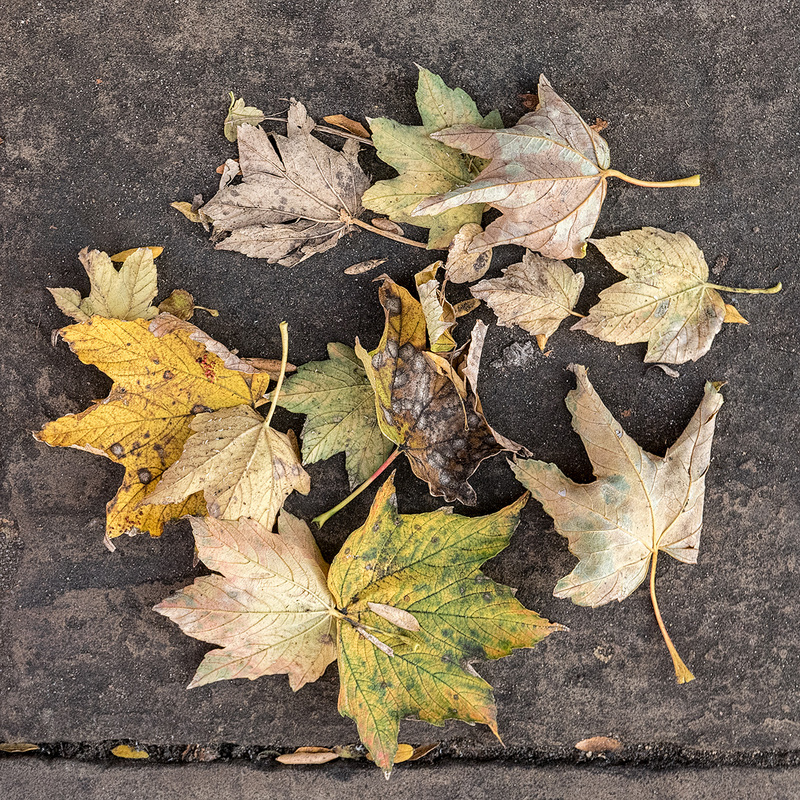 I found these leaves on a pavement in Greenwich, and they seemed such a natural composition once I had carefully removed a few peripheral leaves. You do these so well – the loose circle, the refined, quiet colors and the right-side-up, right-side-down aspect of the leaves make this a lovely image. Thank you so much Lynn. It’s surprising how many leaves land wrong-side-up, but sticking to my rules of subtraction but no re-arrangement, I don’t allow myself to turn them over. Rules! Each day is a search for the next image – head down and endeavouring not to collide with a lamp post, tree branch or other obstacle. Please watch your head, as they say! In this composition I think having some leaves right side up and some upside down really adds to the interest. One of the things I’ve noticed is that walking there-and-back are two entirely different visual journeys. Walking in one direction fails to find a ‘composition’, walking back, I see them.